How do you make an American action star appeal to an Asian market? 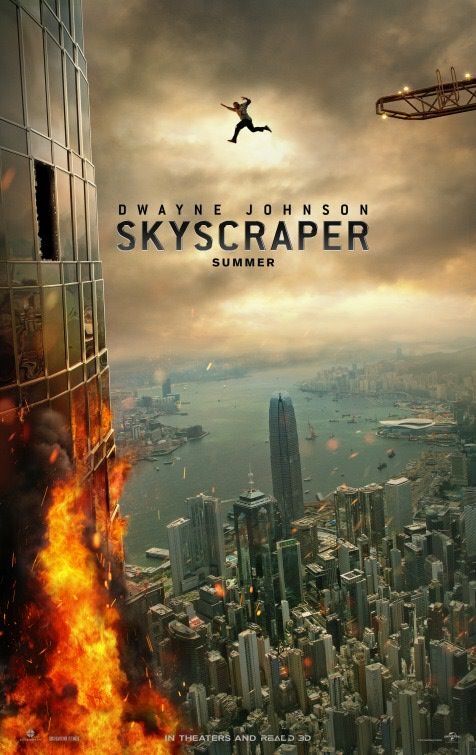 Cast Dwayne Johnson in an action thriller entitled Skyscraper set in Hong Kong. Dwayne Johnson plays Will Sawyer an American security expert who is hired by a Hong Kong Tech billionaire to assess the security of his latest project – a 220 story skyscraper named the Pearl built in Kowloon, Hong Kong, a sophisticated high rise which dwarfs other structures of its size like the Burj Khalifa in Dubai and the Empire State Building in New York. Before the upper levels of the lavish Pearl can be occupied, extortionist terrorists led by Kores Botha played by Roland Moller set fire to the 96th floor. Sawyer’s wife Sarah played by Neve Campbell (The Company, Scream, 54) and young children are trapped in the upper floors. Despite having a prosthetic leg and not completely physically able, Sawyer manages to hijack a crane and enter the skyscraper to find out exactly what plot is afoot. If this plot sounds far-fetched it probably is, but director of Easy A and We’re the Millers Rawson Marshall Thurber does not give the audience time to contemplate the technicalities as he gleefully recreates a fusion of Die Hard and The Towering Inferno in the action packed and sure to thrill, Skyscraper aided by exquisite cinematography by Oscar winner Robert Elswit (There Will Be Blood). Den of Thieves star Pablo Schreiber has a brief appearance as Sawyer’s friend Ben, but the main hero besides Dwayne Johnson in this film, is the actual skyscraper itself an elegantly designed super structure with a pearl at the top which miraculously turns into a visual hall of mirrors surely inspired by the opening sequence from the Bond film The Man with the Golden Gun. Audiences should leave their self-doubt at the door and go and watch the action packed Skyscraper which effectively makes use of the 3D viewing to give cinema goers a justified sense of vertigo. Skyscraper is packed with brilliant sequences that are sure to leave audiences gasping, neatly wrapped up in under two hours and perfectly set in an exotic location like Hong Kong. 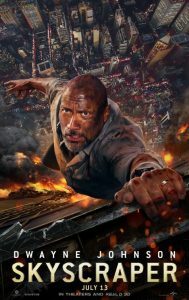 Cleverly plotted, well-filmed and superbly marketed Skyscraper is another reason why Dwayne Johnson has become one of the 21st century’s leading action stars. Skyscaper gets a film rating of 7 out of 10 and will definitely be a hit with action fans that love a certifiable thrill ride.